I love the idea, but what if my kids don’t like Santa? Kids love the IDEA of Santa, but meeting him in person is often intimidating. Kids also love dinosaurs, but meeting one in real life wouldn’t be so great, either. If your child doesn’t like Santa, never fear. By the time Santa arrives in the session for photos, we’ve already captured several great images of your kid(s) on the Christmas scene. Santa then peeks into the scene, in the background, while I keep your child’s attention away from him. After this, we then introduce the Man in Red. If spotting Santa is the end of your session [which isn’t totally uncommon], we’ve already captured a great session, and you’ll have ample images for your Christmas photo selection. Santa is extremely sensitive to a child’s reaction to him, and proceeds slowly with those who aren’t sure of him. Do you charge extra to have more than one of my kids in the session? No. In fact, we encourage Mom and Dad to come prepared for a few images of the entire immediate family. Every year, our scene is markedly different from any other scene we’ve created. We always plan our Christmas scenes with “variety” in mind. We’ll see a great deal of formal Christmas clothing, which is spectacular. Casual clothing–jeans, khakis, sweaters–will also look great. Can I get Christmas cards? Do you sell images for printing my own cards? Not only can you get Christmas cards, you can get a card that will WOW! your friends. We offer several styles, and we’ll have some examples to show. We carefully oversee the quality of all of our products–which is why we do not sell images for printing elsewhere. Please understand that your retainer applies to the purchase of photographs. We’re glad to also offer Christmas cards, but only after your portrait purchase – Quick Pic Sessions must spend a minimum of $290 to order custom Christmas Cards. Full Sessions must spend a minimum of $450 to order custom Christmas Cards. What is the difference between a “Quick Pic” and a full session? Why would I choose one over the other? will allow much more time to capture more variety–and allow more playtime with Santa. I’ll reserve more time, and shoot for approximately 40 minutes. you’ll have the luxury of returning the following week on Tuesday or Wednesday (November 13 & 14) to view your images. We’ll walk with you through the ordering process as you choose your portraits/albums/cards/etc. if you think you’d like a wall portrait, I’d strongly encourage a full session. We ask that all full sessions invest in a 20″ print or larger. If you might like an album, you’ll need a full session. your kids will have much more time to chat and play with Santa! our standard price list applies to full sessions. understand that the Reservation secures our time just for you! Therefore, Santa Reservation Fees are non-refundable. If you call within 72 hours to reschedule your session, we will do our best to accommodate your request. If you have a friend that would like to take your appointment, we’ll be happy to assist you. Otherwise, your deposit will not be refunded unless we can re-book your appointment. obviously, are much faster. Our session will last no longer than 15 minutes. I’ll still shoot with and without Santa, but have less variety–approximately 20 images to view. due to the quick nature of shooting, and ordering in a large volume, Quick Pics are slightly discounted [see below]. You are welcome to order more than one package. you may purchase different poses on the Additions pricing, however we do ask that you purchase a wall portrait 16×20 or larger or one portrait package when you order. 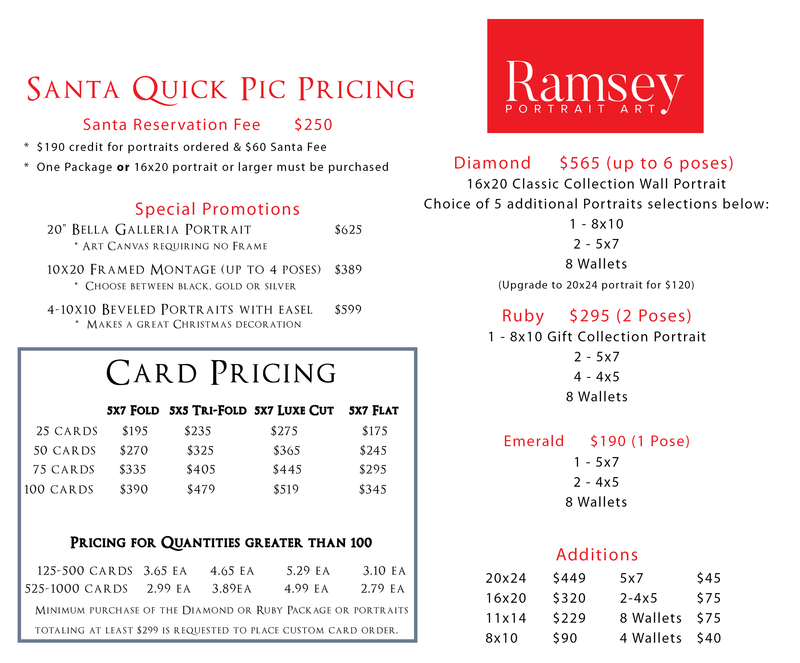 we will have many beautiful custom-designed Christmas cards — we do ask for a minimum $290 portrait purchase. understand that the Reservation secures our time just for you!! Therefore Santa Quick Pic Reservation Fees are non-refundable. If you call within 72 hours to reschedule your session, we will do our best to accommodate your request. If you have a friend that would like to take your appointment, we’ll be happy to assist you. Otherwise, your deposit will not be refunded unless we can re-book your appointment.